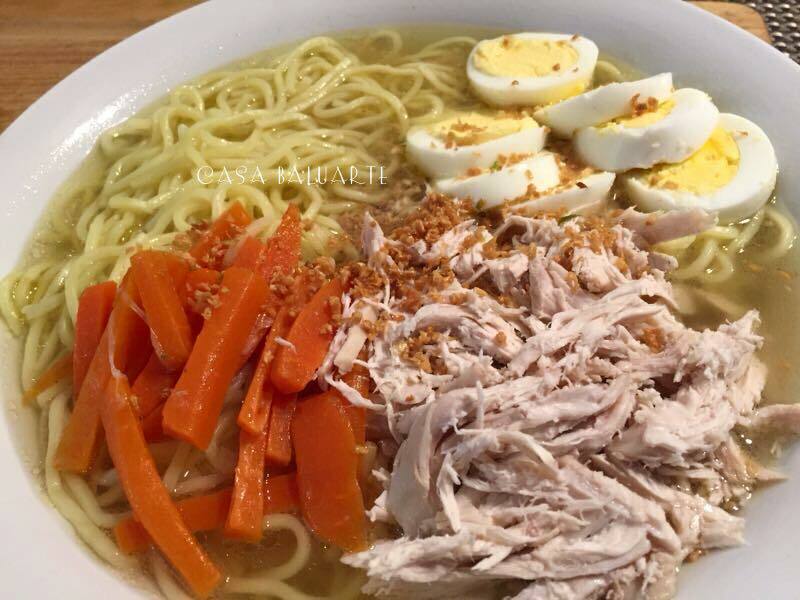 I was craving for some Filipino noodle soup so it was decided Chicken Mami is it. Turned out really good. All worth it. Boil some water in a large pot. Once water starts boiling add a teaspoon cooking oil. Blanch the noodle for few minutes. Remove noodles from the boiling water, rinse in cold water and drain well. Set aside. Boil eggs for 8-10 minutes. Remove from water. Allow to cool, peel and set aside. Brown minced garlic in cooking oil till golden brown. Remove garlic and drain excess cooking oil. Set aside. Using a large pot heat 2 tablespoon cooking oil. Saute a tablespoon of minced garlic and onion. Add the chicken, celery, salt, ground pepper, 8-10 cups of water and bring to a boil for 15-20 minutes in medium low heat or till chicken is fully cooked. Once chicken is fully cooked remove from the broth. Allow to cool and separate the chicken meat from the bones. Shred chicken meat and set aside. Return the bones to the pot and continue to simmer the broth in low heat for another 10 minutes. Add the slices of carrots and chicken knorr cubes to the boiling broth. Season more salt and ground black pepper if needed. 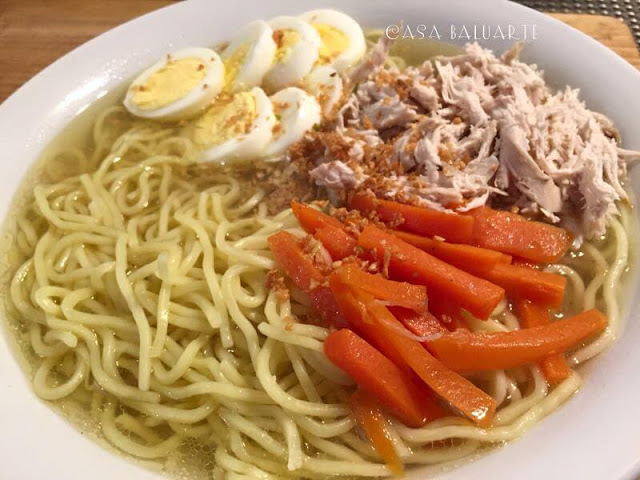 Arrange noodles, chicken, boiled eggs, carrots, toasted garlic and chopped green onion if desired. Strain the stock to remove the bones and other ingredients before adding the soup to the noodles mixture. Serve hot with some pandesal. Enjoy!